64 • FOODSERVICE EQUIPMENT & SUPPLIES • NOVEMBER 2018 facility design p r o j e c t o f t h e m o n t h F• oodservice production for room service and retail dining at Sanford Health System's North Broadway campus in Fargo, N.D., was long overdue for an overhaul after nearly 18 years since the prior renovation. The renovated healthcare facility opened in April 2018. 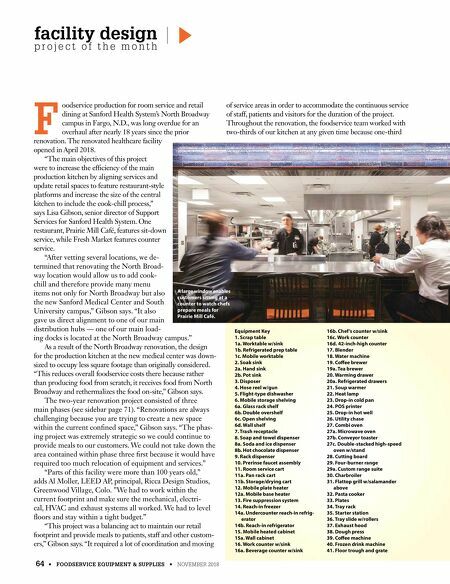 "The main objectives of this project were to increase the ef€ciency of the main production kitchen by aligning services and update retail spaces to feature restaurant-style platforms and increase the size of the central kitchen to include the cook-chill process," says Lisa Gibson, senior director of Support Services for Sanford Health System. One restaurant, Prairie Mill Café, features sit-down service, while Fresh Market features counter service. "After vetting several locations, we de- termined that renovating the North Broad- way location would allow us to add cook- chill and therefore provide many menu items not only for North Broadway but also the new Sanford Medical Center and South University campus," Gibson says. "It also gave us direct alignment to one of our main distribution hubs — one of our main load- ing docks is located at the North Broadway campus." 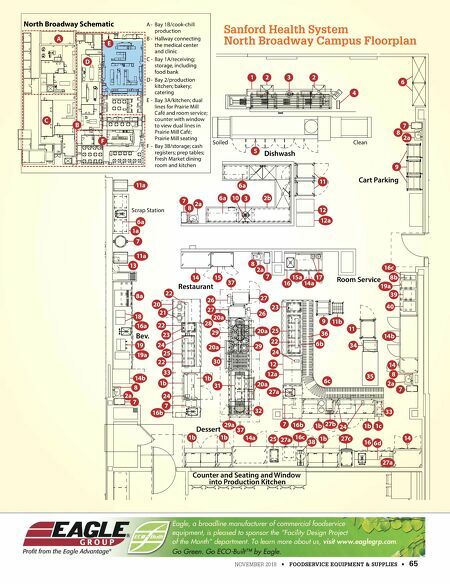 As a result of the North Broadway renovation, the design for the production kitchen at the new medical center was down- sized to occupy less square footage than originally considered. "This reduces overall foodservice costs there because rather than producing food from scratch, it receives food from North Broadway and rethermalizes the food on-site," Gibson says. The two-year renovation project consisted of three main phases (see sidebar page 71). "Renovations are always challenging because you are trying to create a new space within the current con€ned space," Gibson says. "The phas- ing project was extremely strategic so we could continue to provide meals to our customers. We could not take down the area contained within phase three €rst because it would have required too much relocation of equipment and services." "Parts of this facility were more than 100 years old," adds Al Moller, LEED AP, principal, Ricca Design Studios, Greenwood Village, Colo. "We had to work within the current footprint and make sure the mechanical, electri- cal, HVAC and exhaust systems all worked. We had to level œoors and stay within a tight budget." "This project was a balancing act to maintain our retail footprint and provide meals to patients, staff and other custom- ers," Gibson says. "It required a lot of coordination and moving of service areas in order to accommodate the continuous service of staff, patients and visitors for the duration of the project. Throughout the renovation, the foodservice team worked with two-thirds of our kitchen at any given time because one-third Equipment Key 1. Scrap table 1a. Worktable w/sink 1b. Refrigerated prep table 1c. Mobile worktable 2. Soak sink 2a. Hand sink 2b. Pot sink 3. Disposer 4. Hose reel w/gun 5. Flight-type dishwasher 6. Mobile storage shelving 6a. Glass rack shelf 6b. Double overshelf 6c. Open shelving 6d. Wall shelf 7. Trash receptacle 8. Soap and towel dispenser 8a. Soda and ice dispenser 8b. Hot chocolate dispenser 9. Rack dispenser 10. Prerinse faucet assembly 11. Room service cart 11a. Pan rack cart 11b. Storage/drying cart 12. Mobile plate heater 12a. Mobile base heater 13. Fire suppression system 14. Reach-in freezer 14a. Undercounter reach-in refrig- erator 14b. Reach-in refrigerator 15. Mobile heated cabinet 15a. Wall cabinet 16. Work counter w/sink 16a. Beverage counter w/sink 16b. Chef 's counter w/sink 16c. Work counter 16d. 42-inch-high counter 17. Blender 18. Water machine 19. Co"ee brewer 19a. Tea brewer 20. Warming drawer 20a. Refrigerated drawers 21. Soup warmer 22. Heat lamp 23. Drop-in cold pan 24. POS printer 25. Drop-in hot well 26. Utility chase 27. Combi oven 27a. Microwave oven 27b. Conveyor toaster 27c. Double-stacked high-speed oven w/stand 28. Cutting board 29. Four-burner range 29a. Custom range suite 30. Charbroiler 31. Flattop grill w/salamander above 32. Pasta cooker 33. Plates 34. Tray rack 35. Starter station 36. Tray slide w/rollers 37. Exhaust hood 38. Dough press 39. Co"ee machine 40. Frozen drink machine 41. Floor trough and grate A large window enables customers sitting at a counter to watch chefs prepare meals for Prairie Mill Café.